• If you are going on a mission trip, some countries consider green military. So before ordering green duffel bags for a missions trip keep this in mind as you do not want to be considered military. •A lot of our customers have been buying the zippered duffel bags because they are easier to load, but remember that they will also be easier for customs officials to go through than a top load duffel bag would be if you are traveling out of country. It also makes easier access for thieves. 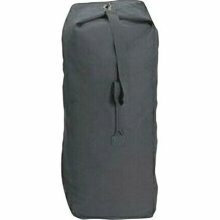 Click here to view all of our duffel bags.